Here is another great documentary. The following article is interesting to me. Judging by the amount of hits this site gets from internet searches for “horn knobs” I think it might be interesting to you too. Most teamsters who take pride in their team of oxen adorn them with horn knobs. While some other metals are used, they are almost always made of brass. The price of brass keeps climbing as does the price of labor. Most shops have switched to CNC machines that require costly programming that can only be offset by either an investment in very large orders or exorbitant prices. This article from 1866 presents a possible alternative. It advises the use of turned wooden knobs! Would any serious teamster switch to wooden knobs? I think it is doubtful, but an interesting idea none the less. The article specifies a knob 4″ x 4.5″. I am sure knobs this size would be functional but I don’t think I would have any appreciation for them ascetically. Perhaps at half scale they would look good but then I wounder how long they would last and what they may look like after daily abuse. Certainly, more intricate knobs could be turned and rather than worn every day they could be only worn for show. I understand some Maritime teamsters do this already with some of the more ornate brass and aluminum knobs. In addition to the wood species that are recommended in the article, I would think Osage Orange would be an excellent choice. The heart wood is both extremely durable as well as rot resistant. Some of the very dense exotic woods should work as well but caution would be needed as many of these have been known to cause allergic reactions. If anyone chooses to try this please let me know how it works out! The ends of the horns of some cows and are so pointed, that unless mounted with knobs, serious wounds are easily inflicted. We have seen the flesh of neat cattle laid open inches in length by pugnacious bullocks, and horses and colts with dangerous and even fatal wounds given by the horn of some hooking beast. The small brass knobs which are screwed on the horns, are worth but little, as they are too small. In order effectually to prevent injury, the balls should be as large as a man’s fist. Moreover, when vicious cattle have such large knobs on their horns, they will soon get completely over their propensity to hook, and large and small will herd peaceably in a small yard, where it would be dangerous to keep them, were there no knobs on their horns. We once owned a hooking cow with long, sharp pointed horns, that was a terror to every other animal in the yard, until large knobs were put on her horns, when she shortly became peaceable and harmless as a lamb, permitting cattle, that once trembled with fear when a rod distant, to feed close by her side. We have long accustomed to use large wooden knobs, for the horns of every animal more than one year old, if the horns had attained sufficient growth to admit of boring a gimblet hole near small end, without entering the quick. In horns of some cattle the quick extends to within half an inch of the tips, until they are, perhaps, two years of age, and the horns of some cows, and oxen may be bored, without touching the quick, three inches or more below the ends. To make these knobs, select a few well seasoned, sound sticks of some tough wood, which will not split easily, like yellow locust, iron wood (or hornbeam), river beech, or pepperdge. A piece two feet and a half long and 4 inches thick in the clear, will make six knobs, 4 inches in diameter and 4.5 inches long. They should be shaped like fig. 2 above, and an expert woodturner will get them out in a few minutes at a cost of about two cents a piece. Soon after they are turned, they should be sawed apart and bored through with a .5 inch bit, to prevent unequal drying and cracking. The pin hole (seen in the cut) should be bored .75 of an from the tip end, using a sharp nail bit. Then the hole should be reamed out with a bung-hole borer, shown in fig. 3, making a tapering hole, as indicated by dotted lines in fig. 2, about an inch in diameter at the end of the knob. Soak the knobs thus made, several days in linseed oil or coal tar, to prevent shrinking and cracking when on the horns. 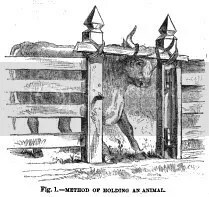 If the animal to be adorned will not allow its horns to be bored, make it fast by horns to a bar or pole fastened securely in a gate or doorway, which has strong posts. Ream out the holes to fit the horns well. Then crowd on balls, mark each horn on both sides with a square-pointed awl, and, removing the balls, bore the horns half-way through from each side, using a small gimlet having a sharp screw. Use pins of No. 11 or 12 steel wire, 3 inches long, filed to round points. The holes in the horns should be bored “drawing” to keep the knobs from working loose – that is, they should the effect to spring the pin down in the middle, but not more than one fourth of its diameter. When the holes are so bored, the pins must driven in with some force. To do this, a heavy sledge hammer, or stone weighing 20 or 30 pounds, should be held against the knob to prevent all jarring, as cattle are extremely sensitive to any blow upon their horns. Drive each pin about a quarter of an inch beneath the surface. 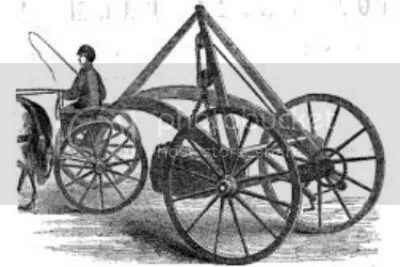 Hammon’s improved ox yoke as published in The Cultivator Vol 3, third series 1855. The annexed figures are views of an improvement in Ox Yokes, for which a patent was granted to Heman B Hammon, on the 16th of last May. The nature the invention consists in securing over the end of the bow, the ferrule, c, fig. 3, and securing the bow in the beam, a, fig. 2, with the washers, e and f, figs. 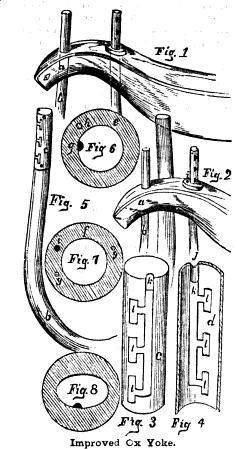 6 and 7.
a a is one half of the yoke beam made in the usual manner, showing the bow, b, secured in the yoke beam by the ferrule, c, and the washer, e f c. fig. 3 is a view of the ferrule before it is secured to the bow, d. fig 4 is a longitudinal sectional view of the ferrule. k is a groove to receive the projection, g, of washer, e. j is a concave in the upper end of the groove, from three eighths to one inch in length, to prevent the top of the ferrule from spreading apart when the ferrule is on the bow. I I are apertures, two or more, to receive the projection, g, after it has passed down the groove, A. The apertures, I, and projection, g, are to hold the bow in the yoke beam as at, a, fig. 2. The object of having one, two, or more apertures in the ferrule, is to suit it to any sized necks. e and f are views of the washers. h is a hole through the washer to receive the pin, i, the pin, t, and hole, h, is to prevent the washer, e, from being disconnected from the ferrule, e, if by accident the bow should be raised up through the yoke beam as shown in fig. 1 and the washer. e, should be raised out of the lower part of the aperture as shown in fig. 1. g g are screws to firmly secure the washer to the top side of the yoke beam, m, is a screw to secure the ferrule to the bow Fig. 6 is a view of the bow with the ferrule attached. It will be observed that the washer, fig 3, has an oblong opening in it; this is to make it adjust itself to a yoke, the surface of which is either straight or hollowed, as in the old-fashioned kind. 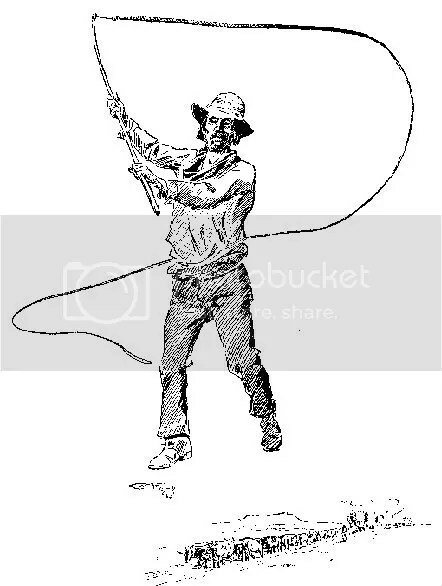 The claim of this patent is for the combination of the ferrule, c, or its equivalent, and the washers, e, and f, for fastening ox bows, as thus illustrated and described. More information respecting this improvement In ox yokes may be obtained by letter addressed to the patentee, Mr. Hammon, at Bristolviile Trumbull Co Ohio. The actual patent is linked below. I finally wrote something for the “oxen” header above. This Machine differs from all other machines for these purposes in its convenience for transporting Stumps, Stones, Cannon, Shafts, Castings, or any heavy weights. After having lifted them with its immense purchase, and strongly trussed frame. The combination of the arched reach with the truss, gives ample room for the load, while the wheel may be of common size. The load being on 4 wheels, is easy on the team, and the machine may be worked by either oxen or horses. The superiority of this Machine as a wall builder, makes It deserving of especial notice. The stone, after being lifted out of the ground, can be drawn alongside the wall to the end and the machine turned so as to bring the load directly across the wall in which position the heaviest stone can be deposited with ease, either at the bottom or top of the wall, and the machine may then be turned back, leaving the stone in place. For particulars, Address PACKER & FISH, Mystic River, Conn. This article appeared in the same publication. Wall Builder and Stump Puller. 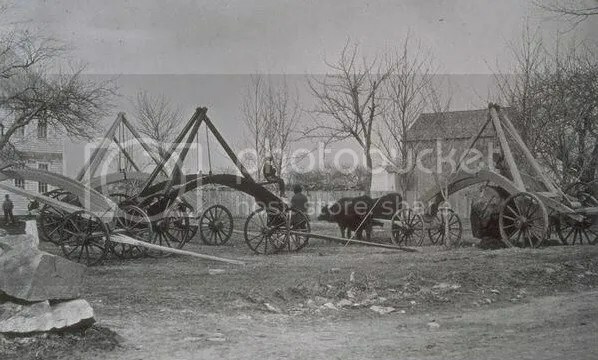 Mr. Packer, of Mystic Conn., in working among the rocks of New London County found the necessity for a machine to lift heavy rocks transport them and deposit them in walls or wherever needed. So he invented one with a pair of shears on strong wheels held apart by two powerful curved reaches giving room for a stone to be swung high between them. For a wall layer, when large stones, say from 1 to 10 tons are to be moved, it is doubtless an excellent thing and has done first rate work in New London County. As a stump puller, it must demonstrate its own excellence. After finding the advertisement and article above I was hooked and did a little research and found that it was developed and patented in 1865 by George Washington Packer of Connecticut. I have not been able to find the patent information but I did find the image below, at connecticuthistory.org, of the device being demonstrated. Note the huge boulder lifted out of the ground. Finally, I found that just last October the Mystic River Historical Society posted an article by Lou Allyn siting a pamphlet with a description of the devices use. According to the article the author and date of the pamphlet are unknown but I think it gives a great insight to its use and a bit of the times. An excerpt from the pamphlet is below. more, all through otherwise the work of getting on the heavy top stones would be up-hill indeed. Hands follow the stone-puller to chock the wall before the great stones settle, that is, to fill tip all crevices, great or small, with suitable stones. Quite considerable judgment and forethought are requisite in the selection and placing of the rocks, both in building and chocking, to make a neat piece of work. I hope you found this as interesting as I did! This video is almost an hour and twenty minutes long and is in Korean with no subtitles. I honestly couldn’t imagine watching it in its entirety so I started skimming it. I ended up hooked and had to start it over to watch it all from the beginning. I guarantee you will get more from it than whatever is on television tonight! This is a wonderful documentary about a Korean couple, Mr. Choi Won-Kyun, his wife Lee Sam-Soon, and their faithful cow that they use to farm with in the mountains of Korea. The couple are in their eighties and the cow is forty years old! No that is not a typo. She is forty years old! Yes it is interesting as an ox enthusiast to see their cattle and equipment and to watch their methods but this is much bigger than that. “Perseverance” keeps popping into my head as I watch it. If you enjoy it, and I’m sure you will, then you can get the DVD which includes English subtitles. In Australia, an ox is referred to as a “bullock” and a teamster is referred to as a “bullocky”. The use of large spans of bullocks was common much later than here in the U.S. and the few remaining “bullockies” still work them this way, very similar to the old “bullwhackers” of the U.S.. Here is a fantastic video of one such bullocky from 1969. It was made by The Commonwealth Film Unit and directed by Richard Mitchell. As I watch, it is interesting to note the similarities and differences with our cattle, equipment and methods here today. I imagine that man was every bit as tough as the thick greenhide plaited whip he is cracking! My original intent in doing book overviews was to try to help people be more confident in their ox related book buying decisions by giving a brief description and to categorize the book as either a practical guide or more of a history book. Well this book has a lot of history in it but it isn’t a history book full of dates and time lines. If you try, you could glean some practical advice from it but I wouldn’t call it a practical guide. I don’t know how to categorize it other than to call it just plain beautiful! 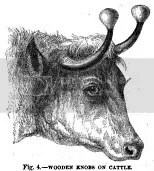 It has just over one hundred pages and all but a handful contain at least one beautiful picture of fine Nova Scotia head yoked oxen and many contain several. Most of the pictures, taken by Terry James, are accompanied by quotes taken from interviews with various teamsters. The quotes make you feel like your eavesdropping on a couple of old teamsters regaling each other about their teams of yesterday and how it was in their heyday The book could easily stand on its own with just the fantastic pictures, and insightful quotes but it does include some text, written by Frances Anderson, colorfully explaining the history and culture of oxen and their teamsters in Nova Scotia. 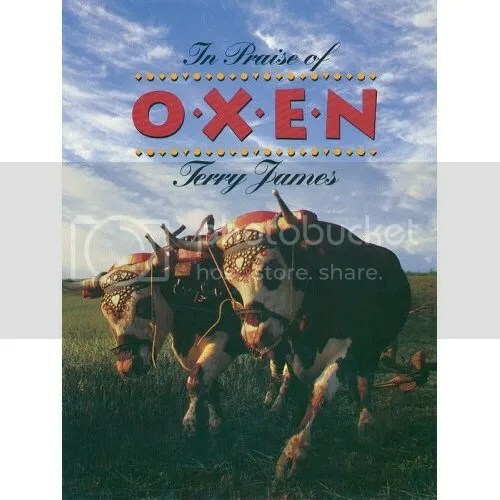 The book is broken up into acknowledgments, preface, introduction, and just three chapters including “EVERYBODY HAD OXEN”, “THEM TIMES, THE CATTLE WAS WORKED”, and “THE CATTLE DO DRAW A CROWD”. This book is like no other. It won’t help you with any training problems and it won’t fill you with bunch of historical facts to expand your ox knowledge but it will certainly entertain you and will likely inspire you!